The above image was created to demonstrates the influence of Aramaic on the Hebrew writing system. The verse is a portion of Deuteronomy 31:24 with paleo-Hebrew, Dead Sea Scroll, and the later Aleppo Codex typographic examples. This Dead Sea Scroll example comes from a fragment.2 It is written in Aramaic script but has a distinct Judaic influence. Some call it the Jewish Script, while others call it the Square Script. The Dead Sea Scrolls span a long time period and have different stylizations. This selection is an example of where the Aramaic influence on typography was evolving and becoming dominant. The image has been colourized by me from the black and white original for aesthetic purposes. 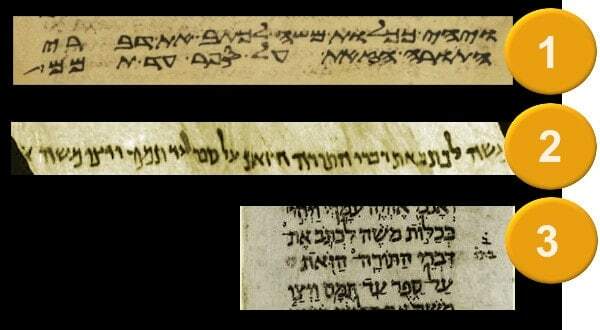 This sample is from the Aleppo Codex (10th century AD, copied in Tiberius, Israel).3 Before the discovery of the Dead Sea Scrolls, this was one of the oldest Biblical Hebrew texts available. This style and period is called the Masoretic text. It is an advancement of the earlier Aramaic influenced Jewish Script. This has become the standard Hebrew religious script in use today. For more information see The Role of Hebrew in the Jewish Aramaic World.